Loving Creations for You: Nautical Mickey Mouse 3.5-tier Chiffon Cake! 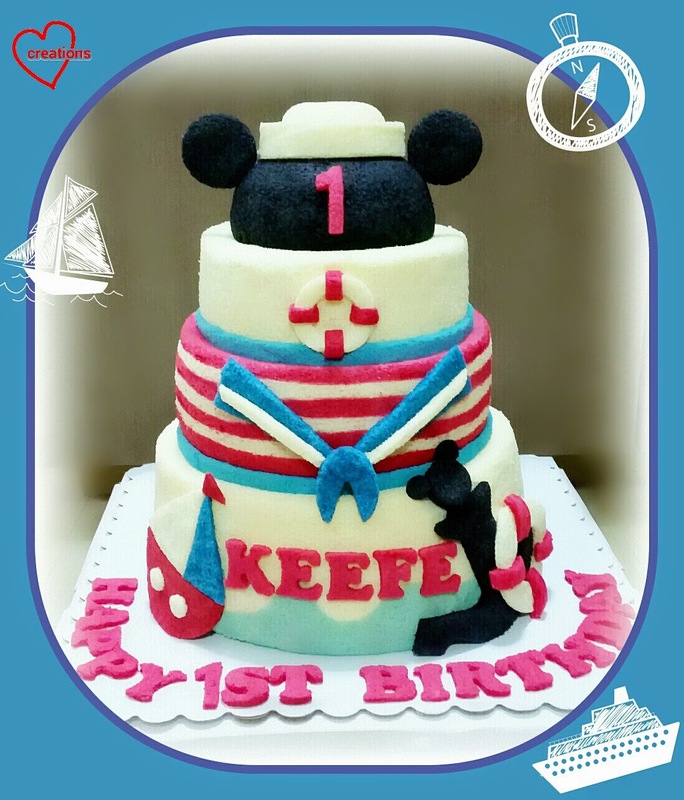 This is a 3.5 tier Nautical Mickey Mouse Chiffon Cake I made for dear Keefe’s 1st birthday! All the tiers including the Mickey head are made from chiffon cake. You may recognize the Mickey mouse vanilla chiffon cake, now dressed in sailor costume and sailor hat! His mum wanted me to make a cute mickey mouse anchor as well! The bottom sea waves tier may look a little familiar. That’s because I modified the waves ‘frequency’ from my Frozen chiffon cake to look like sea waves with sky backdrop. I was super impressed by the effort his wonderful mum made in decorating and coordinating the whole set at the party. She was very involved in the cake design so it went really well with her lovely backdrop and desert table. Thank God cake was well-received and it was a joy to make it for Keefe. Happy 1st Birthday to Keefe! You are really creative with your chiffon cakes. May I know how much you would charge to do a birthday cake (chiffon) for an old lady?